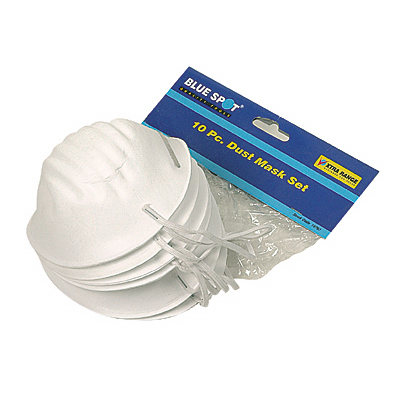 10pc general purpose dust mask set from Blue Spot Tools. This dust mask is suitable for hobbyists and DIY enthusiasts. The dust mask is designed to relieve nuisance and discomfort caused by exposure to coarse, non-toxic dust and particles. General purpose dust mask, disposable with elastic strap and metal strip for precise fit. Will not protect against fine particles, gasses or vapours.